"Gayle provided me with one of the most insightful, uplifting sessions I have ever had! I look forward to more meetings with Gayle." I offer Webinars, Transformational Workshops, Inspirational Talks, Books, Consultations, Resources, and Self-Empowerment Techniques. NOTE: Please see the PRICES & APPOINTMENT page for reading prices and booking information. I have over 20 years professional experience and have given thousands of successful sessions. 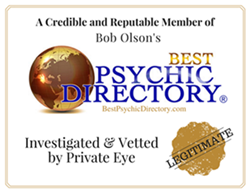 I am one of the most positively reviewed people on Bob Olson's Best Psychic Directory for over 12 years. Enjoy videos, radio interviews, and recordings of live readings on the MEDIA page. SOUL &AMP; SPIRIT is a private Facebook group for enthusiastic spiritual seekers who are ready to learn, grow, heal, share, and explore all things Spirit with other like minded people in a safe and supportive environment. I offer guidance, topics for discussion, WEBINARS for CLASSES & DEVELOPMENT, and much more!